Read this article on our NEW Website. (note the font and page size has been adjusted for easier reading.) Here. The Rebuttal: Despite the absolute outrageousness behind this comment about the leader of the free world, The Weekly Rebuttal will acknowledge this comment (not just for an attempt to use Kanye West's popularity to have this edition actually read by viewers) but to truly point out how ignorant and ridiculous this claim truly is. President Bush is perhaps the single most important and powerful person on the planet. It is highly unlikely that such an event during his presidency was overlooked because of racism especially due to the attention and devastation and loss of life it has caused. White people, if for some reason Kanye either didn't realize or even know, WERE ALSO in Louisiana. Race played NO part in governments response to Katrina. The mayor of New Orleans, a black female, was primarily responsible along with the governor of Louisiana for evacuating people, consulting the Louisiana Levy Board, and seeking out how poorly the board managed these funds. The federal government, especially the Bush administration, with the exception of Mr. Brown and FEMA, had little foothold on the situation, especially since they relied too heavily on local officials to do their jobs. In lame man's terms, if the local government had carried out its duties, the death toll would be NO WHERE NEAR as catastrophic as it is. With that, how could one argue (except for the World Can't Wait and the Revolutionary Communist Party) that President Bush was responsible for faulty Levies? In fact the World Can't Wait and Revolution newspaper (ironic as it is that a Communist party has an independent media) should change their wanted posters. According to the poster, "The Bush regime is responsible for...[s]lash[ing] the funds for flood control...that could have saved thousands...." When in actuality, the Levy board's funds were cut by the local government and the funds were outrageously mismanaged by the Board itself. The newspaper also states that the Bush administration, "Enforced and promoted the most blatant racism." An awkward statement considering Condoleeza Rice is featured on the list of wanted....I guess that newsletter failed to realize this (not to mention a number of other things, including the newspapers list of stories and page numbers on the front cover of issue 16, which like their belief in a government of Communism, was slightly off), or perhaps Condoleeza Rice is racist toward black Americans as well.... Who knows maybe Leprechauns live in your basement for all we know. Simply put, the local government was unprepared and the President admits this himself. If race was such a major factor, why did the President work so well with Hurricane Rita that was expected to hit Corpus Christi, Texas, an area dominated by Mexican Americans? The argument that this was racially motivated makes no sense. However, Kanye West is entitled to his opinion, but as a conscious newsletter giving the best advice where it can: Don't look toward Kanye West for your political advice. Because after all, Kanye West doesn't teach me politics. 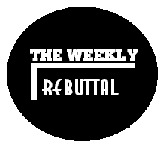 All material owned by The Weekly Rebuttal. Do not reuse without permission from editor.